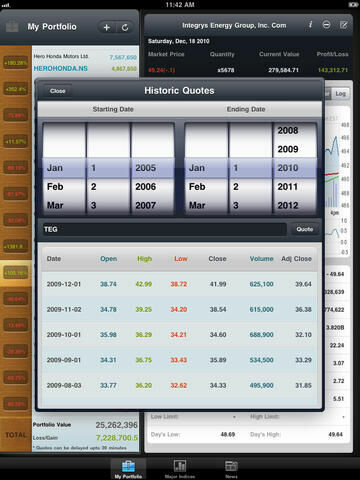 StockPulse is your perfect companion for keeping track of your stocks and investment portfolio on your iPad. StockPulse is suited for both basic users and advanced market analysts who would like technical insights on stocks. StockPulse supports all major exchanges around the globe and gives you a quick overview of your investments even when you are on the move. Designed with user friendliness in mind, StockPulse has a very intuitive user interface which is straight forward and elegant. Have a look at the the app screenshots for yourselves and you will know what we mean. There are no limitations on the number of stocks you can track with StockPulse. StockPulse has detailed technical charts (from one day to almost 5 years), detailed stock information and has support for retrieving historic prices of a stock. Want more - you can get up to date news, customized for just the stocks you have on your portfolio, keep an eye on all major indices around the world like NSE, BSE, NASDAQ, DOW JONES, NIKKEI, STRAITS, TAIWAN, HANG SENG & KOSPI to name a few. We aim at delivering constant updates to StockPulse at regular intervals as with our other apps and your direct feedbacks and ratings will make a lot of difference. StockPulse uses Yahoo! Finance API's and symbols and you might have to add the correct suffix (.NS, .BS etc,) for the symbol to be recognized. - Stock Pulse is now iOS 6 Compatible.